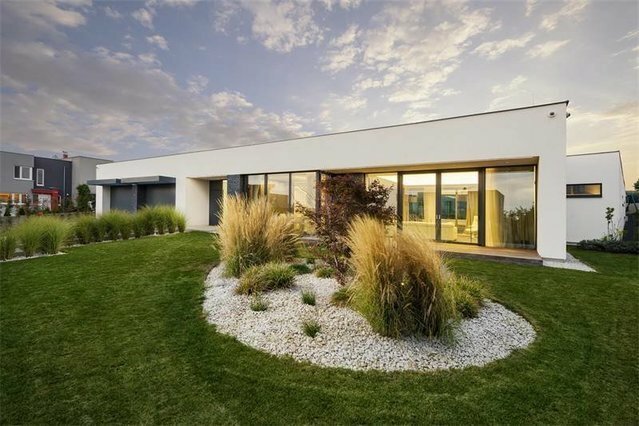 This intriguing V-shaped villa boasts premium materials, top-notch technology and a timeless design. Due to its unconventional floor plan, the luxurious house features unique living spaces and enjoys complete privacy both inside and out. The professionally landscaped zen-inspired garden provides a most calm setting. The house is divided into two wings: The residential wing features a living room with a kitchen and dining area, a master suite, three bedrooms (all w/ ensuite bathrooms & walk-in closets) and a study. Furthermore, there is a cozy reading corner, a utility room, storage space, and two attached garages (w/ a total of 4 parking places). The second wing offers a health & fitness area, complete with an indoor swimming pool, spa and sauna as well as a summer kitchen / dining room with barbecue. The two wings of the villa protect a triangular atrium with a terrace. There are French windows in the majority of the rooms facing the atrium, while the public side windows are small and narrow for privacy. The villa features a smart home control system, underfloor heating, remote controlled blinds and security cameras, air-conditioning, cast concrete floors & screed finishes throughout. The location is convenient to the center of Brno, to major business zones and shopping malls. Interior: 660 sq. m.; built-up area: 709 sq. m.; garden: 1 203 sq. m.; plot: 1 912 sq. m.